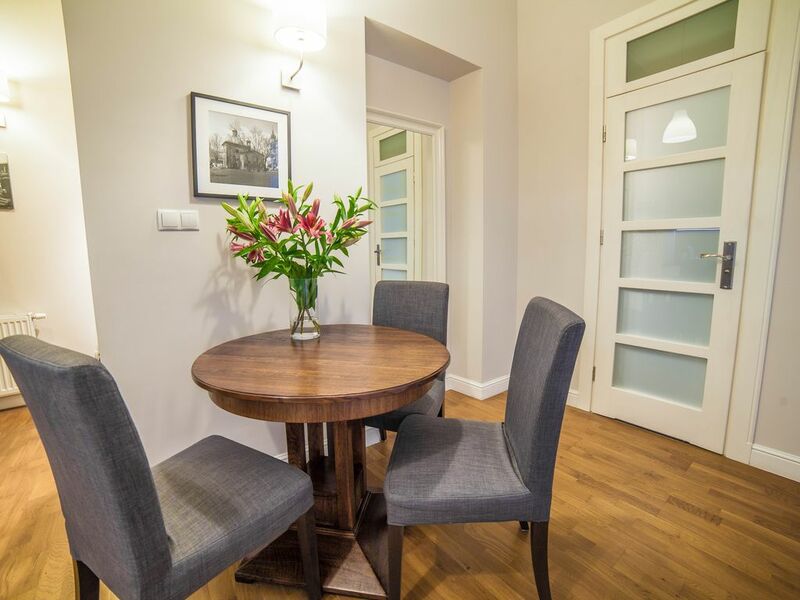 Elegant, cozy and fully equipped Apartment located in the center of the Kazimierz district, 10-minutes’ walk form the Main Market Square (Rynek Główny). The Apartment situated on the first floor of the newly renovated tenement building. The apartment with an area of approximately 40m2 is located on the first floor of the restored XVIII century tenement building. The apartment consists of a living room with a mezzanine, a bedroom, a separate (transitive) kitchen, bathroom and a hallway. In the bedroom is a comfortable double bed, nightstands and lamps and a spacious wardrobe. The balcony connected to the bedroom is the perfect place for morning coffee in the heart of Krakow. In the living room is a sofa (with possibility of sleeping) and a coffee table and the mezzanine with a single mattress. The sofa can be used as an extra place to sleep. The kitchen is fully equipped with the dishwasher, induction cooker, oven, fridge and coffee maker (also cutlery and dishes). On equipped apartment is a Tv, wifi, hairdryer, washing machine, iron and ironing board. The Apartment located is in the center of the Kazimierz district. Nearby there are shops, restaurants and monuments and the Main Market Square. Right next to the building is located Plac Nowy and Szeroka Street. The area has a very good public transportation to other parts of Krakow. Nearby approximately 2 minutes away are the tram and bus stops. Guests can park along the street (parking is paid from Monday to Friday, from 10am to 8pm). Child sleeping with parents or in their own bed and not requiring bedclothes does not incur any charges for the stay. After prior notice, for children up to three years, we prepare a cot (extra charge). The apartment is designed for 1-3 people, but there is a possibility to accommodate an extra person on the sofa in the living room. This apartment was in a great location in the Jewish quarter. Grocery across the street and bars and restaurants in easy walking distance. The castle area and the main square were an easy walk. The apartment looks to be newly renovated with high end appliances and cabinets. Plenty of storage. Bathroom is also new. It's perfect for two, any more might be a little crowded. We loved Kraków and our apartment. Perfect place to stay in Krakow. Nice modern apartment in an old building. Everything we could have needed was there, and the place feels safe and secure. Perfect location near countless good restaurants. I'd definitely recommend this apartment in particular and the Jewish quarter in general for visitors to the city. Clean and tastefully furnished in a great location. Exceptionally clean and tastefully furnished apartment. Lots of lamps. Loved having a clothes washer. Wi-Fi internet access was reliable. The host, Monika, provided much helpful information on nearby restaurants, coffees shops, markets, and more. Good location in the Kazimierz district away from tourists, yet an easy walk to the tourist-infested Old Town. Others have noted that thicker curtains in the bedroom would help block out street lighting. Though the relative lightness wasn't a big issue for us, we agree that more effective curtains would be welcome. As noted above, having a clothes washer was wonderful. There is no dryer, nor an obvious place for hanging clothes to dry; we had brought some cord and set up a makeshift clothesline. If we travel to Krakow again, this will be our first choice for lodging. The apartment is centrally located- we walked easily everywhere. The light inside is great- doors in bedroom open on to a little balcony that gets the morning sun. Bathroom utilizes space well. It is always a bonus having a washing machine if staying for several days as we did. It would be very useful if there was a folder containing information on all the appliances particularly in the lounge room as all tvs are different! And some local insights as well would help. As we are coming into the extended light of summer time it would certainly promote easier sleep if there were heavier curtains in bedroom. It's also quite noisy at night- but that's to be expected if staying in a hub! Overall a lovely apartment- certainly recommend it to others. We didn't have any realtime communication with the owners but their instructions were easy to follow and all was straight forward. Staying here certainly contributed to our immense enjoyment of visiting Krakow. Communication was easy and they left the apartment clean after visit! Would be more than happy to have them again here! I totally recommend. Fabulous property, incredibly clean and conveniently located. Superb short stay at this lovely little apartment conveniently located and with an amazing restaurant just around the corner. The only improvement we would make is to have 'black out' curtains in the bedroom. The street light was very bright all night and we are used to a bedroom being dark. We actually moved the bed to be against the other wall and slept much better the second night. We would still most definitely stay again should we revisit Krakow. This is a very cute and newly renovated apartment in a great location. Very comfortable for two people. We stayed for 20 nights and really enjoyed it. Great restaurants nearby and easy walking to Stare Miasto. Check-in time is after 16:00 on arrival day. Check-out time is before 12:00 on departure day (if the apartment is ready, there is the possibility of early check-in). Please respect nightly silence from 22:00 to 6:00. The non-smoking apartment.